Red Cross Exec Doesn't Know What Portion Of Donations Go To Harvey Relief : The Two-Way Critics have long complained that the charity's finances are not transparent. A spokesman interviewed by NPR couldn't answer questions about whether that has changed. 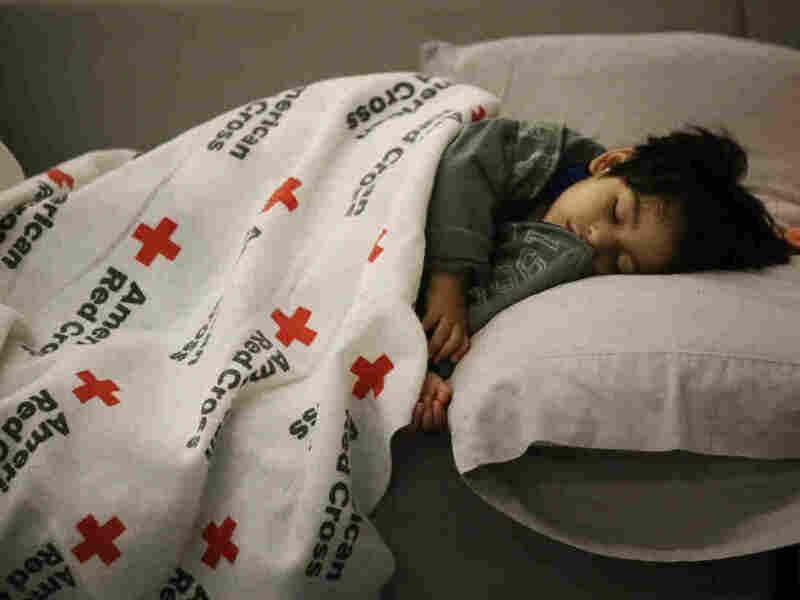 Malachia Medrano, 2, sleeps at the George R. Brown Convention Center in Houston, which has been set up as a shelter for people escaping the floodwaters from Hurricane Harvey. Editor's note on Sept. 1: Some listeners and readers have asked why NPR pressed Red Cross operations and logistics executive Brad Kieserman about how much of the money his organization receives will actually be spent on helping those affected by Hurricane Harvey. NPR's questions were follow-ups to several years of reporting by NPR and ProPublica about shortcomings in the organization's disaster relief operations and misleading claims about its finances. NPR has asked several times in recent years to speak with Red Cross President and CEO Gail J. McGovern. Those requests have been turned down. Prior to this latest interview, NPR asked again. The organization said McGovern was unavailable, but did make Kieserman available. As Americans are opening their wallets and donating to relief efforts in the aftermath of Hurricane Harvey, one of the most prominent charities is the American Red Cross. But donors might be surprised to learn the Red Cross doesn't make clear what percentage of their dollars will go directly to helping the victims of the storm. Dating back to 2014, NPR and Pro Publica have reported that the Red Cross misstated how donor dollars are spent. A study released by Sen. Charles Grassley, R-Iowa, concluded that the Red Cross had spent $124 million — one-quarter of the money donors gave for earthquake relief in Haiti in 2010 — on internal expenses. In an interview with Morning Edition host Ailsa Chang, Red Cross executive Brad Kieserman was asked about reports that the charity has unusually high administrative costs. "We are committed, I am committed, my team is committed to using our resources and donor dollars in a way that best helps the people of Texas," said Kieserman, vice president of disaster operations and logistics. Kieserman said that as of Wednesday morning the Red Cross had spent $50 million on Harvey relief, mainly on 232 shelters for 66,000 people. Chang: Through donations, how much of every dollar goes to relief? Kieserman: Yeah, I don't think I know the answer to that any better than the chief fundraiser knows how many, how much it costs to put a volunteer downrange for a week and how many emergency response vehicles I have on the road today. So I think if he was on this interview and you were asking how many relief vehicles in Texas, I don't think he'd know the answer and I don't know the answer to the financial question I'm afraid. Ailsa pressed on. She said that NPR had reported that 25 percent of the money donated for Haiti to the American Red Cross after the 2010 earthquake went to internal spending. Chang: Is that still happening? Such a substantial percentage of donations going to internal administrative costs, rather than to relief? Kieserman: It's not something I would have any visibility on. I can talk about what it costs to deliver certain relief services. Chang: You don't know what portion of that amount. Chang: You don't know what portion of that total amount is for relief. Kieserman: No, I really don't. I wish I could answer your question, but it's not something I have visibility on in the role that I play in this organization. She asked him if he has "visibility" on any efforts by the Red Cross to reduce the amount of money spent solely on internal costs. "The folks I work for are very, very attentive to cost effectiveness and cost efficiencies in making sure that as much as every dollar that we spend on an operation is client-facing," said Kieserman. Their conversation can be heard on Thursday's Morning Edition.